It doesn’t take long for everyone to find home in this one month rental we’ve landed here in Astoria, Oregon and in tandem with the mouth of the Mighty Columbia. The baby finds his fingers in whatever new cupboard crawl space they can find. The toddler experiments with his first time being able to open a refrigerator, regularly daily presenting us with a jug of apple cider he’s found his new favorite beverage. Our nearly-teenager hangs out with others his own age at a rec center a few blocks downhill, collecting phone numbers and learning to transform his iPod into a working phone with a few hacks. The wallpaper here, the mix matched dishes, indeed even the smell of the place are all so reminiscent of my grandmother’s house. It feels like home. But we are desperate for exploration even as rainy days and warm couches aiming at a television–our first in over five years–tempt us to laze away the days. Instead, when we can brave the ever present drizzle that is Winter approaching on the north coast, we walk up and down the steep hilly neighborhoods between newly renovated Victorians overlooking downtown and painted vivid brilliant pinks and blues and violet. 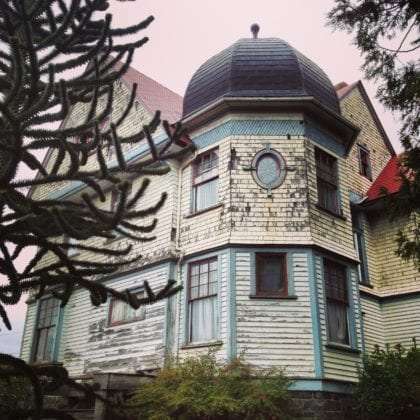 Others, yet to see their sale to a loving new owner, sit like haunted mansions holding all the secrets of the oldest settlement on the Pacific Coast. They are as varied as the town’s residents, which range from salty old fisherdogs to transgender baristas. All of this living on the side of a large hill crowned with a column where you can climb some 164 stairs before flying wooden airplanes off into the Sitka spruce forest below, the Columbia dumping into the Pacific in the distance and a vaulting 4-mile bridge spanning it all. Freightships roll up the mouth, stopping one last time on their voyage to Portland or perhaps beyond. Breweries and cafes and dive bars and fancy hotels line the always bustling downtown, and everything just a few blocks walk from everything else. It is wet, and cold, and dark by 5pm, but what this city offers is far more valuable than weather. It’s buying locally made bread daily from a bakery five blocks away. It’s a community center where teenagers can play basketball or Playstation instead of dabbling in more nefarious pursuits. It’s great breweries, strong coffee, smiling faces in bars from strangers and Sunday farmer’s markets. It’s the sound of the high school band practicing nightly through the forest. It’s the ability to live a life where a tank of gas could last a month while you leave the car parked and walk your everydays. It’s a notable lack of chain stores, and the ability to skip the strip malls one town over completely in daily life. It’s the birthplace of our second son and, for awhile at least, it’s home.